Skin changes are among the most visible signs of aging. Evidence of increasing age includes wrinkles and sagging skin. Whitening or graying of the hair is another obvious sign of aging. The middle part (dermis) contains blood vessels, nerves, hair follicles, and oil glands. The dermis provides nutrients to the epidermis. The inner layer under the dermis (the subcutaneous layer) contains sweat glands, some hair follicles, blood vessels, and fat. Skin changes are related to environmental factors, genetic makeup, nutrition, and other factors. The greatest single factor, though, is sun exposure. You can see this by comparing areas of your body that have regular sun exposure with areas that are protected from sunlight. With aging, the outer skin layer (epidermis) thins, even though the number of cell layers remains unchanged. The number of pigment-containing cells (melanocytes) decreases. The remaining melanocytes increase in size. Aging skin looks thinner, paler, and clear (translucent). Large pigmented spots, including age spots, liver spots, or lentigos, may appear in sun-exposed areas. Changes in the connective tissue reduce the skin's strength and elasticity. This is known as elastosis. It is more noticeable in sun-exposed areas (solar elastosis). Elastosis produces the leathery, weather-beaten appearance common to farmers, sailors, and others who spend a large amount of time outdoors. Sebaceous glands produce less oil as you age. Men experience a minimal decrease, most often after the age of 80. Women gradually produce less oil beginning after menopause. This can make it harder to keep the skin moist, resulting in dryness and itchiness. Some medicines are absorbed by the fat layer. Losing this layer changes the way that these medicines work. The sweat glands produce less sweat. This makes it harder to keep cool. Your risk for overheating or developing heat stroke increases. Growths such as skin tags, warts, rough patches (keratoses), and other blemishes are more common in older people. As you age, you are at increased risk for skin injury. Your skin is thinner, more fragile, and you lose the protective fat layer. You also may be less able to sense touch, pressure, vibration, heat, and cold. Rubbing or pulling on the skin can cause skin tears. Fragile blood vessels can break easily. Bruises, flat collections of blood (purpura), and raised collections of blood (hematomas) may form after even a minor injury. Pressure ulcers can be caused by skin changes, loss of the fat layer, reduced activity, poor nutrition, and illnesses. Sores are most easily seen on the outside surface of the forearms, but they can occur anywhere on the body. Aging skin repairs itself more slowly than younger skin. Wound healing may be up to 4 times slower. This contributes to pressure ulcers and infections. Diabetes, blood vessel changes, lowered immunity, and other factors also affect healing. Skin disorders are so common among older people that it is often hard to tell normal changes from those related to a disorder. More than 90% of all older people have some type of skin disorder. Wear protective clothing and a hat when needed. Good nutrition and adequate fluids are also helpful. Dehydration increases the risk of skin injury. Sometimes minor nutritional deficiencies can cause rashes, skin lesions, and other skin changes, even if you have no other symptoms. With aging, the outer skin layer (epidermis) thins even though the number of cell layers remains unchanged. The number of pigment-containing cells (melanocytes) decreases, but the remaining melanocytes increase in size. 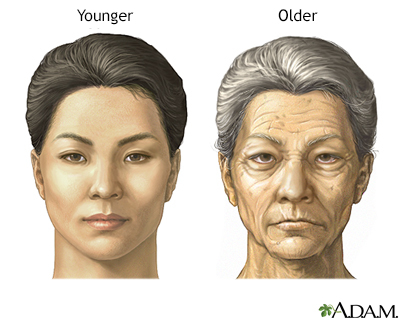 Aging skin thus appears thinner, more translucent. Age spots or liver spots may appear in sun-exposed areas. Changes in the connective tissue reduce the skin's strength and elasticity. This is known as elastosis and is especially pronounced in sun-exposed areas.